They don’t make finer, or more thought-provoking writers than Ted Leeson, or at least they don’t as far as fly fishing goes. Ted is the other side of John Gierach, much though it seems an improbable connection: John is earthy and in your face; while Ted is reflective and has words that take their time to tumble home. Despite coming at you from opposite sides, both writers stay with you in a way that few others can and between them they leave the competition in their dust - we are lucky to have the pair of them around in our time. 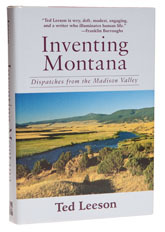 Inventing Montana is about a regular trip made by a group of friends to fish the Madison and it is an unashamedly intellectual book. If your bag is light fiction that you read, trash and forget, then do not go here, because it will be the equivalent of picking up a charged cattle prod by the wrong end. In the process of telling the story, Ted picks up every piece of the jigsaw puzzle of why we go fishing and tears it down to its component parts, a process which would be destructive were it not done with such great affection. Inventing Montana has good days and bad days and blanks and much food and alcohol and a great deal of thought about the way we order our lives, and if some of the paragraphs are so densely written that they pull you up in your tracks, then some of the descriptions are lyrical enough to be worth reading a second or even a third time. We go deer stalking each year in Dunoon and I don’t even like shooting reds, but then life has a habit of making itself more complicated than we would ever arrange it to be and everyone who has ever been on an annual trip will recognise the questions Ted asks - we have all been there, whatever our place is called. Sometimes there are answers, but more often there are not, which is just as well, because otherwise we might stop going to see if we can find them out.